These pocket screwdrivers have the size (and shape) of a quarter. The edge is shaped like a ramp so they can be used for different screw sizes. The range of edge thickness goes from 0.030" to 0.090". They are specially good for flat screws but can be used for Phillips too. 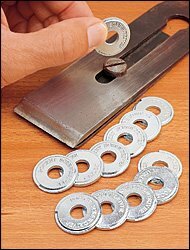 They are certainly more convenient than using a coin, the nails (ouch!) or other objects. You can carry them in a keychain, wallet, etc. The pricing is $7.20 for a dozen and you can read more about this curious item at Lee Valley's web site. 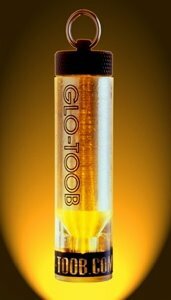 Glo toob are markers available in different colors. The toobs provide light in 360 degrees so they are used either to light up small rooms or as signaling devices, they can't be used to illuminate an objet since they don't have a directional beam like flashlights. The FX model has 7 different modes: 100% constant on, 25% constant on, Flash, Fast Strobe, Slow Strobe, Sos and Throb. The runtime goes from 30 to 80 hours depending on the mode selected. They are available in different led colours: red, blue, green, amber and white. The green one is the most visible (green is the color that the eye sees better) so it's perfect as a marker, the red one is suitable to preserve night vision (red is the color that less affects the eye), amber is nice for ambient illumination, blues are cool and might be used to detect substances that contrast better under blue light (blood for example), the white one is of course general purpose. There's also an IR model suitable to be used with Night Vision equipment. The toobs have negative buyancy (they float), are waterproof and shock proof, they use an A23 battery, not your every day battery but is not hard to find either. You can find more information at the official Glo Toob page. Pricing is about $22.